TV ratings for this week are still in a toss as GMA7 continued to penetrate the AGB Nielsen rankings. 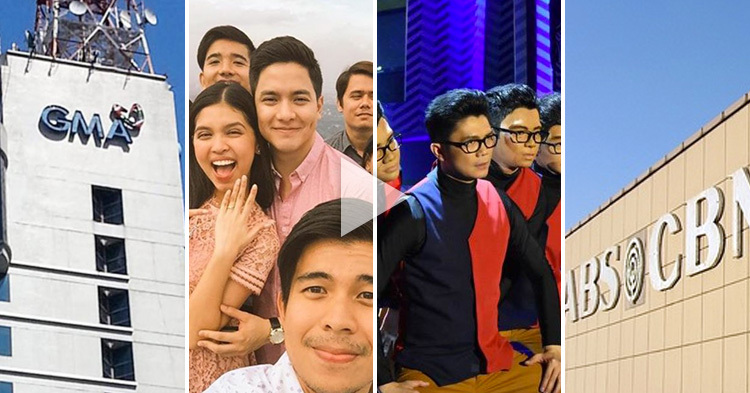 In the latest data from AGB Nielsen and Kantar Media for the week of October 16 - October 22, ABS-CBN remained the dominant network in both surveys but GMA is continuing to challenge its rival. Eat Bulaga's TeleMovie, "Love is..." and It's Showtime's "Magpasikat". 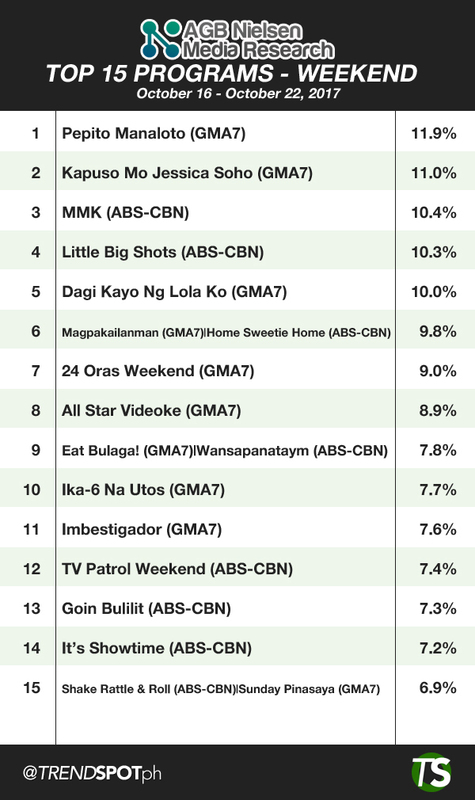 FPJ's Ang Probinsyano remained the leader in overall and weekday rankings in both AGB Nielsen and Kantar Media surveys. 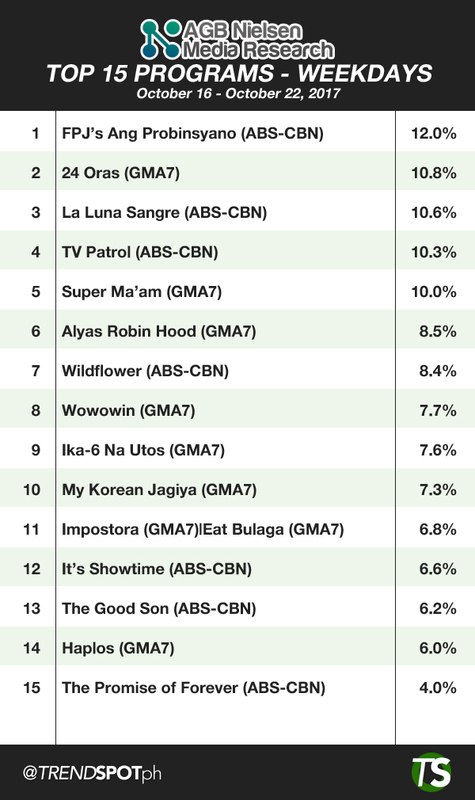 Ang Probinsyano posted an average ratings of 39.5% in Kantar Media and 12.0% in AGB to take the number one spot in Overall and weekday rankings. 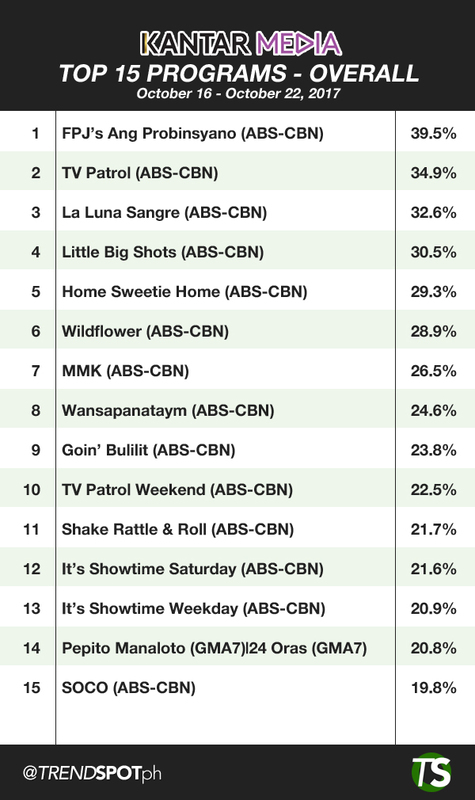 Weekend rankings on the other hand is shared by the Kapamilya and Kapuso networks as Litte Big Shots take Kantar's leaders board with 30.5% ratings and Pepito Manaloto taking AGB Nielsen's weekend rankings with 11.9% ratings. 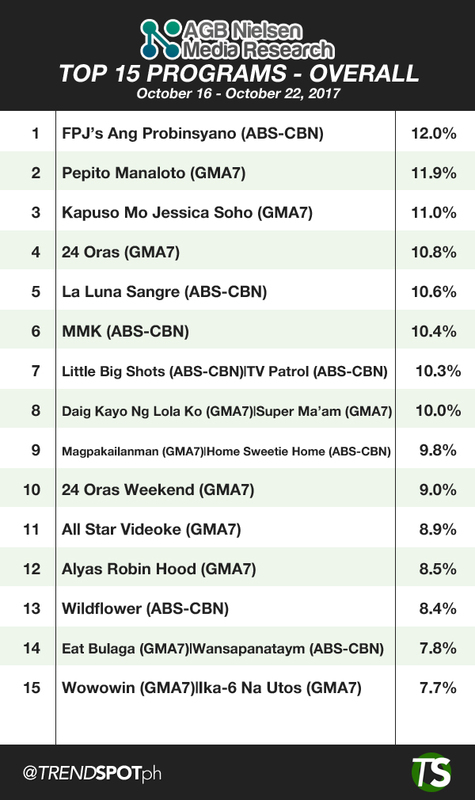 AGB Nielsen's Overall, Weekday and Weekend rankings also showed GMA7 posing great challenge to ABS-CBN's leadership as Pepito Manaloto followed Ang Probinsyano closely in the overall rankings at number 2 with 11.9%, 0.1% difference from Ang Probinsyano's 12.0%. 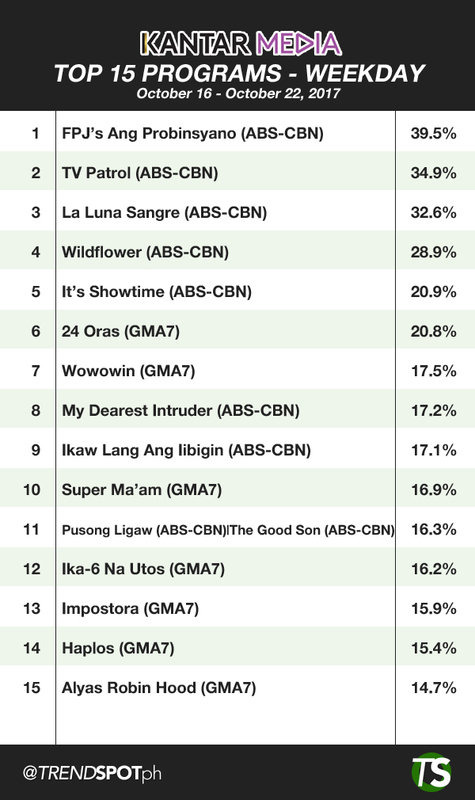 Weekday's number 2 also belonged to Kapuso, as 24 Oras followed Ang Probinsyano with 10.8%. 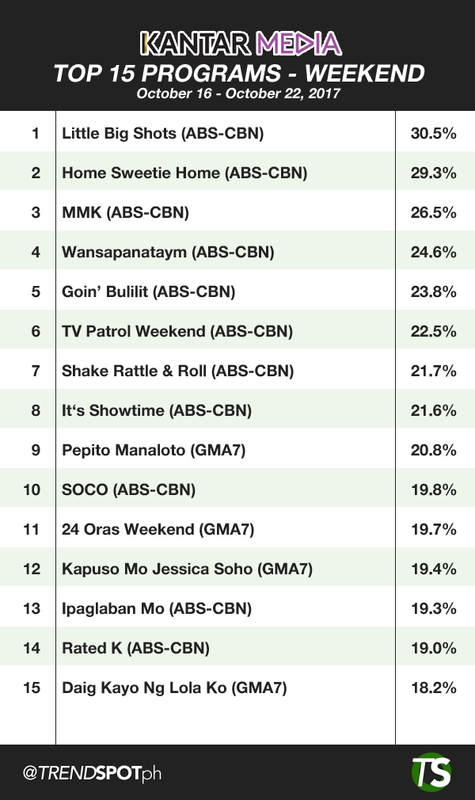 Weekend's top 2 on the other hand is Kapuso territory as KMJS followed Pepito Manaloto with 11.0%. For the battle of noontime shows, It's Showtime dominantly beats Eat Bulaga in both Overall, Weekday and Weekend rankings from Kantar Media. It's Showtime ranked 12th and 13th in the overall rankings with 21.6% and 20.9% ratings respectively while Eat Bulaga failed to reach the top 15 with 12.9% and 12.2% ratings. For weekday rankings, It's Showtime took the 5th spot, with 20.9% beating Eat Bulaga's 12.2% which again failed to join the top 15 programs. For weekend where Eat Bulaga premiered Aldub's first telemovie, It's Showtime still remained victorious as it claimed the timeslot with 21.6% leaving the telemovie Love Is under the top 15 rankings with 12.9%. If Eat Bulaga did not triumph in Kantar Media, AGB Nielsen reported win for the AlDub telemovie. Eat Bulaga's Love Is scored 7.8% in the overall ranking beating It's Showtime which did not enter the top 15. For Weekday and Weekend, Eat Bulaga also won with 6.8% (11th) vs 6.6% (12th) and 7.8% (9th) vs 7.2% (14th) ratings respectively. Overall rankings of shows for the whole week.